Once in a while a DS carrying case comes along that looks good and is practical too. 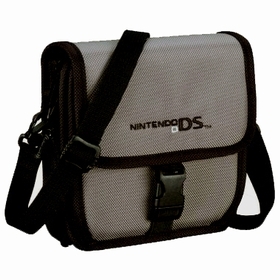 The A.L.S 15 Nintendo DS carry case is one such accessory. This was the first carry case I received for my Nintendo DS, back when the console was originally released in America in 2004. It's durable, high quality and my A.L.S 15 case is still in great condition today. For owners of the original design Nintendo DS, this case is almost perfect. It's easy to see why Nintendo chose this case to officially endorse. If you have an original design DS and you can find one of these cases for sale, snap it up! The A.L.S 15 is designed to hold the original Nintendo DS. The holding pocket in the side fits the console snugly. Though a DS Lite will fit in the holding pocket, it's not such a snug fit and may move around in transit, meaning that the console won't be quite as well protected. When you are lugging your console around, you can use the included shoulder strap which is durable and clips firmly to the case. Releasing the clip on the front of the bag and unzipping the front compartment reveals a total of nine game card holders. The holders are made out of stiff plastic and are unlikely to break under regular use. There's also a zip up accessory pocket in the front flap, that can be used for storing headphones or instruction manuals, as well as an elasticated compartment for your spare stylus. To top it all off, there's even a pocket in the very top of the case that can be used to store your AC adaptor. You remember I said this case was almost perfect? Well, if you live in the UK, you'll struggle to fit your AC adaptor into this pocket. UK plugs are a little bigger than the ones used in America or Japan. You can get the adaptor in, but you won't be able to get the compartment fully zipped. An extra half an inch height on this compartment and everything would have fit perfectly. Several other cases also suffer from this problem. This is a fantastic, hard wearing yet light and spacious case for your Nintendo DS. Ideal for serious players on the move with plenty of space for games. As with many accessories for the original DS, obtaining this case can be a little difficult. If you need a quality carry case for your DS console then keep an eye out for this little beauty.